I have a bit of a thing about panoramas. So here are a few I’ve compiled this time around. In the middle of the photo above, you can see the remains of a stone wall. This is in fact the remains of the original wall of the ancient harbour of Seleucia (which was the main port for Antioch (now known as Antakya). The nearby village is called It was from this very wall that Paul and Barnabas would have set out for the first great missionary journey (cf. Acts 13:1-4). 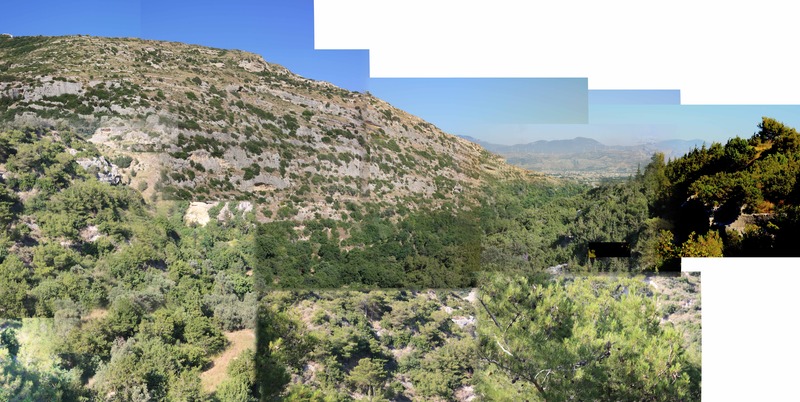 This was taken in the hills above old Seleucia – and at the top of the mountain in the image, Simon Stylites the Younger lived on a pillar for a number of years. And there he died.